Posted under Library on Tuesday, November 10th, 2009 at 9:16 am, by Brian Herzog. Post and comments available via the RSS 2.0 feed. Both comments and pings are currently closed. In our tiny library we keep the current year and a the past year only of our magazines. A patron asked why we didn’t have older issues of a magazine and my co-worker asked “Where would we keep them?” The patron replied she’d be happy to keep them at her house. 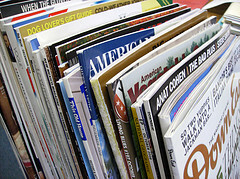 @Winnie: That brings up the topic I forgot to mention – what do libraries do with magazines they weed? We have a big wire basket we put them in for patrons to go through and take whatever they want (and almost everything gets taken). It’s also just big enough for patrons to bring magazines from home and drop them off, for others to take. We don’t really publicize that part of it, because I’m sure we’d quickly get overwhelmed, but right now it’s more or less self-regulating, and so much better than just throwing them all away.